As I mentioned in Friday’s post, last week I asked simplify 101’s Facebook followers the biggest source of clutter in their houses. This kicked of a new series of clutter-busting organization ideas to do before the school year begins. This way, you can start the school year on an organized foot! On Friday I shared organization ideas for paper clutter, and today we’ll talk about craft supply clutter! Ready? Let’s get to it! Clutter hotspot #2: Craft supplies. Nothing can squash creativity like clutter from our craft supplies! (Have you been there, too?) What’s more, with the kids heading back to school it could mean you finally have some time to take part in your favorite crafting endeavors. This means now is a terrific time to do some triage on your craft clutter. I have an entire self-paced online class about organizing craft supplies, but for now, here are what I consider mission-critical ideas for organizing your craft supplies. 1. Declutter. I know. It hurts. Those craft supplies have so much potential, or at least they did when you bought them. But, if you have more stuff than will comfortably fit in the space it’s meant to occupy, the result is clutter. Before investing in new storage solutions and trying to maximize your storage space, do a sanity check on your stash. Do you have more craft supplies than you could use in a lifetime? Do you have so much it makes you feel overwhelmed? Do you have some supplies that you really don’t like? If so, it’s time to declutter. Don’t worry about how much you paid or how useful these items could be (someday). Instead, what will fit in the space you have and keep what you’ll feel proud and happy to use. Then, let the rest go. 2. Assess your storage. Once your stash is whittled down to those items you love, do a sanity check on your storage. The easiest way to keep creative clutter at bay is to make it easy to return your supplies to storage between crafting sessions. So, if you don’t currently store your craft supplies close to where you create, seek solutions. 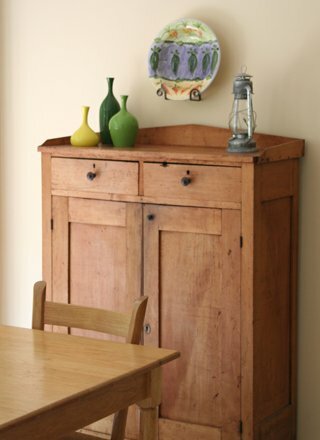 Could you repurpose a cabinet by the kitchen table for craft supplies? Could you invest in a rolling cart for your creative supplies, and carve out space for the cart in a nearby closet? 3. Create the habit of putting supplies away. If you like to work on multiple craft projects at once, invest in storage for in process projects. Then…tidy up between crafting sessions, remembering that a clear and clutter-free craft area is an invitation to create. Our next few clutter hotspots are all created by our kids. Not just in your home, but in homes everywhere, our littlest family members have a way of creating clutter. But there are solutions! 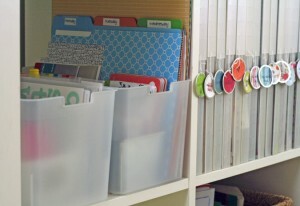 Check back tomorrow for our first round of organization ideas for kids’ stuff!